The founder of the Complete Energy Consultancy has used Marmox Thermoblock to tackle thermal bridging around the floor/wall junction of his new home. Situated in Gloucestershire, Richard Britten’s super-insulated four-bedroom property features Cotswold Stone clad walls, which offer a U-value of 0.1 W/m2K, while the dwelling’s hot water and negligible space heating will be met using a ground source heat pump. The walls, being erected by locally based MH Bricklaying, feature a total of 184, 100mm x 600mm Thermoblocks, laid at the base of the 100 mm thick dense concrete blockwork outer leaf. This is separated from a similar inner leaf by a 300mm wide blown-bead filled cavity. 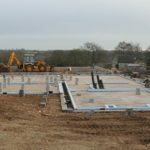 Also, due to being supported off a concrete beam-and-block floor construction, the internal block walls will require a further 34 of the 140mm wide units, all supplied by builders merchant, Buildit in Gloucester. Richard Britten commented: “Basically we are moving from an old cottage with thick stone walls and window seats, which was hard to heat, to a very high performance property that despite the 150 mm quarried Cotswold Limestone face, will require minimal heat input. Although I hadn’t used Marmox Thermoblocks before, they are the ideal solution for tackling cold-bridging around the perimeter and where the internal block walls sit on the beam-and-block floors. The concrete columns have a low conductivity, so do not present thermal bridges themselves, and when coupled with the highly insulating XPS insulation core, a combined thermal conductivity of 0.47W/mK is achieved. Thermal Comfort | Can natural slate help improve energy efficiency?